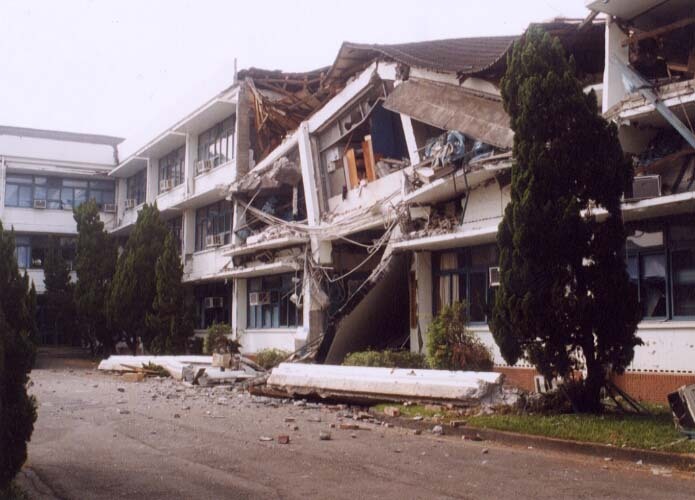 A large earthquake struck the island of Taiwan at approximately 1:45 a.m. (local time) on September 20, 1999. The quake killed or injured thousands of people, left thousands more homeless and caused extensive destruction to buildings, roads and utilities. Most of the casualties and damage occurred in the central Nantou, Taichung and Yunlin Counties. The quake triggered a series of landslides. Afteshocks: Major aftershocks measuring as much as 6.8 and 6.3 on the Richter scale occurred the day after the major quake. More than 2,000 aftershocks were recorded in the days following the main shock. The plate tectonic systems in the region near Taiwan where this earthquake occurred are extremely complex and have changed considerably throughout geologic time. The tectonic setting and the dynamics of interaction have been extensively discussed in the literature (see references below). The island of Taiwan is located on the convergent boundary between the Eurasian and the Philippine Sea tectonic plates. Presently, and during the Plio-Pleistocene period, principal tectonic plate interaction in the vicinity of Taiwan, has been closely related to the Ryukyu and Luzon arc-trench systems, characterized by subduction, convergence and rotation, but marked primarily by the collision of the Luzon volcanic arc with the Asian continental margin. Also, there has been apparent northward subduction of the Philippine Sea plate beneath the Ryukyu arc on the Eurasian plate along the Ryukyu Trench. The Ryukyu arc is to the east and northeast of Taiwan while the Luzon Arc System is south of Taiwan (see figure). Both volcanic arcs extend onto the island of Taiwan. The tectonic interactions are extremely complex. In the vicinity of Taiwan, They both subduction and plate convergence take place but not along a simple plate boundary or subduction zone as it would be commonly conceived, and this is due to the difficulty of subducting a portion of the continental crust which is markedly buoyant. Apparently, a wide distributed shear system developed during different stages of the arc-continent collision. Earlier tectonic plate convergence in the vicinity of Taiwan was marked by an apparent eastward subduction of the Eurasian plate underneath the Luzon arc on the Philippine Sea plate. However, this shear motion moved westward with time, forming a broader zone of deformation involving subduction, collision, and plate consumption, rather than a discrete well-defined plate boundary. On Taiwan, this wide belt of deformation extends for about 100 km from the western to the eastern offshore region of the island. This active, complex and ever changing tectonic interaction and collisions along a wide deformation belt, have affected the entire island of Taiwan and have created in the past the Central Mountain Range, known as the Penglai orogeny and the Longitudinal Valley of eastern Taiwan, both areas of high seismicity. The Central Range is characterized by fast uplift at a rate of 2-3 cm/yr or more and fast tilting at both lambs of the mountains, the west end tilting westward of about 1.0µ radian/yr while the east of about 3.0 µ radian/yr. Both regions are characterized by the widespread distribution of shallow-focus earthquakes. The earthquake of September 1999, had its epicenter in this zone of Central Taiwan - thus no tsunami was generated. As already described, Taiwan is located on the convergent boundary between the Eurasian and the Philippine Sea tectonic plates, a region characterized by subduction, convergence, rotation, and collision of the Luzon volcanic arc with the Asian continental margin. BothThe Ryukyu arc is to the northeast, and the Luzon Arc System to the south, converge onto Taiwan. Northward subduction of the Philippine Sea plate beneath the Ryukyu arc on the Eurasian plate along the Ryukyu Trench can generate, large potentially tsunamigenic earthquakes. According to old Japanese records, on April 24, 1771, a large earthquake (with an estimated Richter magnitude of 7.4) occurred near the southermost Ryuku Islands, just south of Ishigaki Island, an area controlled then by the Japanese Satsuma samurais. A tremendous tsunami was generated according to old records. Claims of maximum runup of 50m to 85m have veen made. 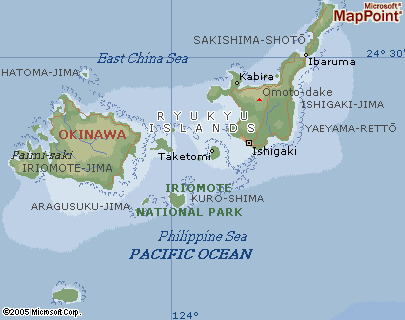 Tsunami devastated the islands of this group and the more distant islands of the Miyako group. Huge blocks of coral were carried by wave action. A large coral block was found 2.5 km inland. Claims were made that the block was not a remnant of erosion but that it was deposited by a tsunami wave. Records of the Satsuma samurais indicate that about 11,000 people were killed in the southern Ryukyu islands. The tsunami effects in Taiwan, Hong Kong and elsewhere in the region are not known. None of the earthquakes with epicenter on the island of Taiwan are not known to have generated tsunamis. However, earthquakes with epicenters near or in the sea can generate tsunamis along the coast of Taiwan and of mainland China. 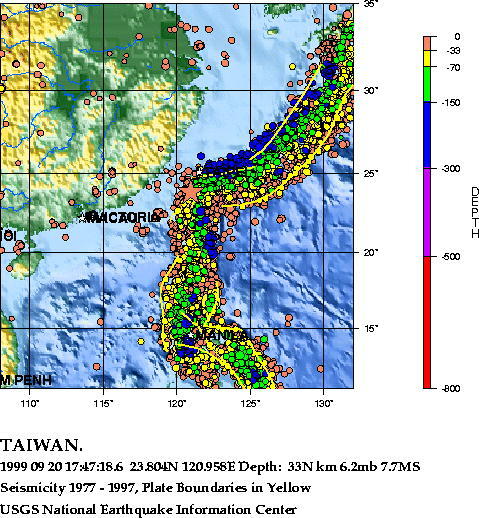 The most recent large earthquake (mb=6.5), in the Taiwan Strait occurred on 16 September 1994 in the western part of the Tainan basin, at a very shallow depth of 13 km. It was named Peng-Hu Earthquakesk. The quake's focal mechanism indicated a sea floor movement consistent with normal faulting, with its axis along a N-S direction. The occurrence of this earthquake indicates that the Taiwan Strait is seismically active and capable of generating earthquakes with Richter magnitudes greater than 6.0. Although it is not believed that this particular earthquake generated a tsunami, earthquakes with magnitude greater than 6 on the Richter scale have the ability to trigger tsunamis, while earthquakes with magnitude greater than 7 and with a large vertical component, have the ability to generate destructive tsunamis. The orientation of the crustal strain beneath the Taiwan Strait appears to be dominated by North-South extension rather than the East-West compression that is observed along eastern Taiwan. Given the complex tectonic interactions of the region, tsunami generation is possible. The tsunami risk for the Taiwan Strait requires careful evaluation and study. Angelier J., Bergerat F., Chu H.-T., Juang W.-S. and Lee T.-Q. (1990). Tectonic-paleomagnetic analyses and the evolution of a curved collision belt : the Hsueshan Range, northern Taiwan. Tectonophysics, 183, 77-96. Angelier, J., H.T. Chu and J.C. Lee (1997). Shear concentration in a collision zone: kinematics of the active Chihshang Fault, Longitudinal Valley, eastern Taiwan: Tectonophysics, 274, 117-144. Chen, W.-P. and H. Kao (1996). Seismotectonics of Asia: some recent progress: in The Rubey Volume IX: Tectonic Evolution of Asia, edited by A.Yin and M. Haarrison, 37-62, Cambridge Univ Press. Chen, K.J., Y.H. Yeh, H.Y. Yen and C.H. Lin (1995). Seismological studies in the Chinshan fault area: J. Geol. Soc. China, 38(4), 335-354. Davis, D., J. Suppe, and F.A. Dahlen (1983). Mechanics of Fold-and-Thrust Belts and Accretionary Wedges, J. Geophys. Res., 88, 1153-172. Delcaillau, B., J. Deramond, P. Souquet, J. Angelier, H.T. Chu, J.C. Lee, T.Q. Lee, T.F. Lee, P.M. Liew and T.S, Lin (1994). Enregistrement tectono-sedimentaire de deux collisions dans l'avant pays nord-occidental de la chaine de Taiwan. C.R. Sci. Acad. Paris, t318, series II, 985-991. Deramond, J., Delcaillau, B., P. Souquet, J. Angelier, H.T. Chu, J.F. Lee, T.Q. Lee, P.M. Liu, T.S, Lin and L. Teng (1996). Signatures de la surrection et de la subsidence dans les bassins d'avant chaine actifs: les Foothills de Taiwan (de 8 Ma a l'Actuel): Bull. Soc. Geol. France, 167(1), 111-123. Hu, J.C., J. Angelier, J.C. Lee, H.T. Chu and D. Byrne (1996). Kinematics of convergence, deformation and stress distribution in the Taiwan collision area: 2-D finite-elememt numerical modelling: Tectonophysics, 255, 243-268. Kao, H. (1998). Can great earthquakes occur in the southernmost Ryukyu arcúTaiwan region? : TAO, 9(3),487-508. Kao, H., S. J. Shen and K.F. Ma (1998) .Transition from oblique subduction to collision: Earthquakes in the southernmost Ryukyu arcúTaiwan region: J. Geophys. Res., 103(B4), 7211-7229. Kao, Honn and Francis T. Wu (1996). The 16 September 1994 earthquake (mb=6.5) in the Taiwan Strait and its tectonic implication: TAO, 7(1), 13-29. Lee, J.C., J. Angelier and H.T. Chu (1997). Polyphase history and kinematics of a complex major fault zone in the northern Taiwan mountain belt: the Lishan Fault: Tectonophysics, 274, 97-116. Lee T.-Q., Angelier J., Chu H.-T. and Bergerat F. (1991). Rotations in the northeastern collision belt of Taiwan: preliminary results from paleomagnetism. Tectonophysics, 199, 109-120. Lu, C.Y., S.B. Yu and H.T. Chu (1998). Neotectonics of the Taiwan mountain belt: AGU Monograph, Geodynamics, 27, 301-315. Lu, C.Y., H.T. Chu and J.C. Lee (1997). Structural evolution in the Hsuehshan Range, Taiwan: J. Geol. Soc. China, 40(1), 261-279. Lue, Y.T., T.Q. Lee and Y. Wang (1995). Paleomagnetic study on the collision-related bending of the fold-thrust belt, northern Taiwan: J. Geol. Soc. China, 38(3), 215-227. Yeh Y.-H., Barrier E., Lin C.-H. and Angelier J. (1991). Stress tensor analysis in the Taiwan area from focal mechanisms of earthquakes. Tectonophysics, 200, 267-280. Yen, H.Y., W.T. Liang, B.Y. Kuo, Y.H. Yeh, C.S. Liu, D. Reed, N. Lundberg, F. C. Su and H.S. Chung (1995) . A regional gravity map for the subduction-collision zone near Taiwan: TAO, 6(2), 233-250. Yu, S.B. and H.Y. Chen (1994). Global Positioning System measurements of crustal deformation in the Taiwan arc-continent collision zone: TAO, 5(4), 477-498. Wang, C.Y., A. Ellwood, F.T. Wu, R.J. Rau and H.Y. Yen (1996). Mountain-building in Taiwan and the critical wedge model: in Subduction: Top to bottom, G. E. Bebout, D. W. Scholl, S. H. Kirby, and J. P. Platt (Editors), AGU Geophysical Monograph 96, 49-55. 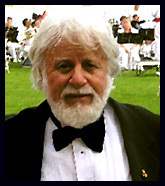 Wu, F.T., R.J. Rau and D.H. Salzberg (1997) . 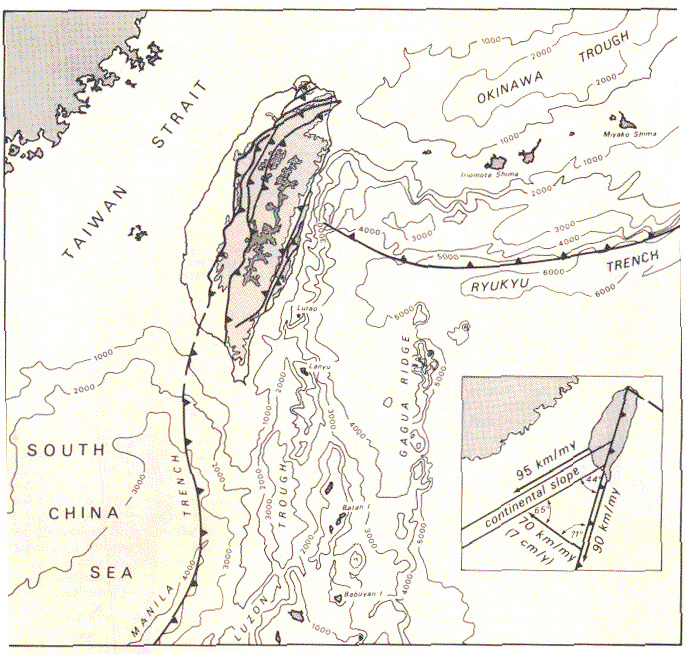 Taiwan orogeny: Thin-skinned or lithospheric collision: Tectonophysics, 274, 191-220.